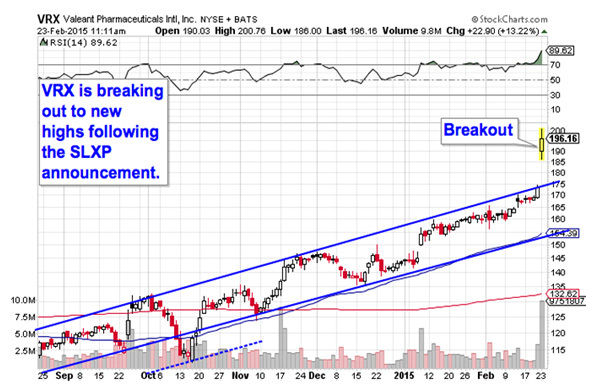 Keep these big-volume stocks on your trading radar. Today, we'll leverage the power of the crowd to take a look at some of the most active stocks on the market today. The rumors were true: After popping on Friday on the possibility of a buyout, news is hitting that Salix Pharmaceuticals (SLXP has agreed to be acquired by Valeant Pharmaceuticals VRX in a deal worth $10.1 billion. The buyout will pay $158 per share in cash to SLXP shareholders. 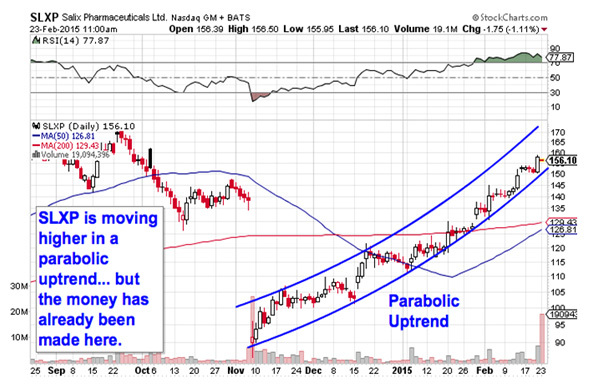 Salix had been in a parabolic uptrend since shares bottomed this past fall. Now it looks like the money has already been made on SLXP, with shares hovering only slightly below the transaction price. Small-cap mortgage servicer Home Loan Servicing Solutions (HLSS is another name that's moving on acquisition news this morning, after announcing that New Residential Investment (NRZ was buying the firm for $18.25 per share in cash. HLSS is up almost 10% on the announcement, trading at a slight premium to the deal price. Again, this is a situation where the money has already been made. 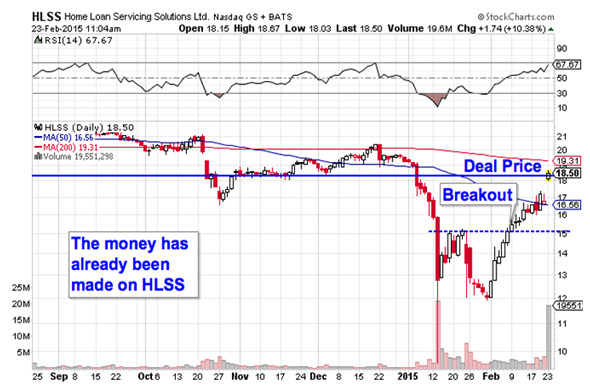 HLSS is likely to move back down to $18.25 from here. The other side of the SLXP trade is Valeant Pharmaceuticals (VRX , the $65.7 billion suitor that's acquiring the smaller pharma firm. Valeant has been trending higher lately, but investors are getting excited that VRX is getting a deal done, and that buying pressure shoved shares above their uptrend this morning. VRX is hitting new highs today, up 13% on big volume. Making new highs is significant from an investor psychology standpoint because it means that everyone who has bought shares in the last year is sitting on gains. As a result, the "back to even" mentality is less of a concern than it would be for a name with a higher proportion of shareholders sitting on losses. For traders who aren't risk-averse, there's still time to build a position in VRX now, just keep a stop on the other side of $175 support. For another take on Valeant, Jim Cramer thinks it is undervalued. 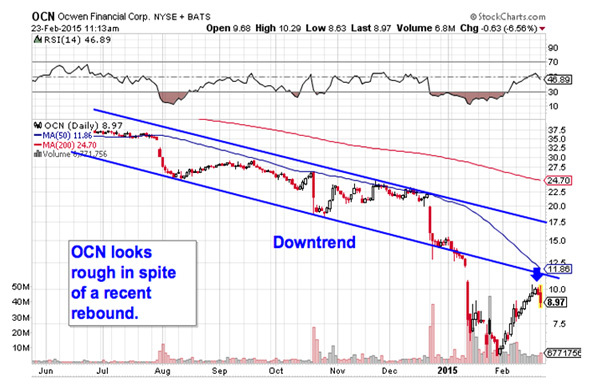 Mortgage company Ocwen Financial (OCN - Get Report) is seeing a very interesting trading session today. After starting the day down significantly, OCN has flipped to a 6% gain as of this writing. That big swing in share prices is being driven by news that Ocwen is selling a servicing portfolio of $9.8 billion in loans to Nationstar Mortgage (NSM . The sale comes as Ocwen faces major regulatory scrutiny, and moves to cut down its scale to reduce customer service complaints. From a technical standpoint, it's a little early to cheer OCN's price action. The downtrend is still very much intact here, and shares are going to be subject to significant earnings risk on Wednesday. Caveat emptor.